You are currently browsing the tag archive for the ‘Taylor Swift’ tag. Among the most famous words ever spoken about Montreal came out of the mouth of Mark Twain during a banquet held in his honour at the Windsor Hotel on December 8, 1881. “This is the first time I was ever in a city where you couldn’t throw a brick without breaking a church window,” he said. These are the words I recalled when I very first arrived in Montreal on the airport shuttle, looking out at the sud-ouest and its many spires and domes. But what I never stopped to think about was, what had compelled Mark Twain to visit Montreal in the first place? As it happens, the reasons for his visit are in many respects far more interesting than his observations on Montreal’s Catholic heritage. His stay at the Windsor Hotel from November 26 to December 9 – a season of grey, grim weather, far from ideal for tourism, as he himself acknowledged – was actually all about business and money. He had come to secure copyright for The Prince and the Pauper. Canadian publishers in Toronto and Montreal had been printing cheap versions of close to a dozen of his works over the previous decade, and many of these volumes had ended up in the United States, effectively undercutting the American versions. But does this have anything in common with Taylor Swift, even tangentially? Yes, maybe a little bit. As Apple Music has just been launched to general controversy, there can be no doubt that the issues that concerned Mark Twain are very much alive still: protecting the rights of artists, and the nurturing of emerging talent. 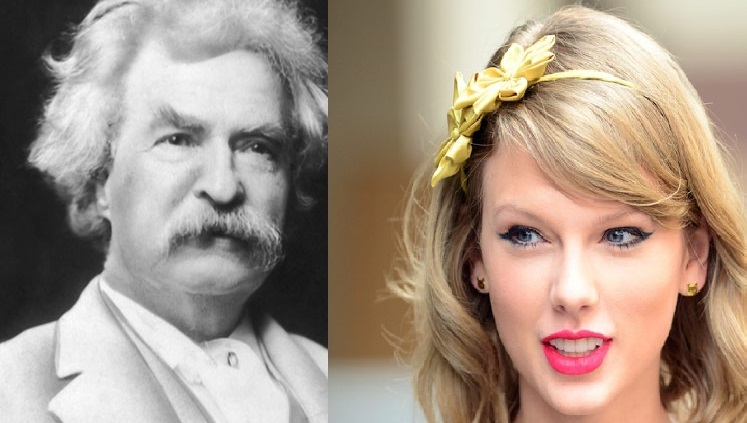 Taylor Swift – perhaps the Mark Twain of our own era? – recently spoke out against Apple, and there is an interesting parallel to Twain, in that she claims to speak not on her own behalf but rather for all those emerging artists who need support. Swift went on to stress that her criticism is “not about me” but rather an attempt to stand up for emerging artists and songwriters. “This is about the new artist or band that has just released their first single and will not be paid for its success. This is about the young songwriter who just got his or her first cut and thought that the royalties from that would get them out of debt,” wrote Swift. “This is about the producer who works tirelessly to innovate and create, just like the innovators and creators at Apple are pioneering in their field…but will not get paid for a quarter of a year’s worth of plays on his or her songs.” The Guardian. Twain and Swift stand up for artists’ rights to be paid, but do so through reasoning that goes beyond the mere business-side of their respective industries. With Twain, there is a social and nationalistic case to be made. If you want to cultivate a society that has some self-awareness, it’s not helpful for this society to depend entirely on cultural artifacts from elsewhere. There’s no doubt that importing foreign literature makes Canada a far richer place, but without also learning about our own stories and culture, we’re effectively cut off from ourselves. As for Swift, she’s adamant that innovation and creation by artists merits reward, just as Apple reaps the financial benefit of its innovation and creativity. There are questions to be raised, to be sure, about whether we strictly recognize artists based on the amount of money we reward them with, and whether such financial rewards are what artists have in mind when they are striving for excellence, but nevertheless, kudos to Swift for pointing out that Apple is wrong to accumulate billions in profits while saying to the “content providers,” that even for a limited time, no, we won’t give you so much as a penny for your efforts. That’s criminal, and if it was whiskey they were making, no corporation would dare to rip them off.